A continuous green light signals that the device is working correctly. A continuous red light signals a ground-fault tripping. A continuous red light signals an active thermistor trip. A continuous red light signals an active overload trip; a flickering red light signals an imminent trip (overload warning). 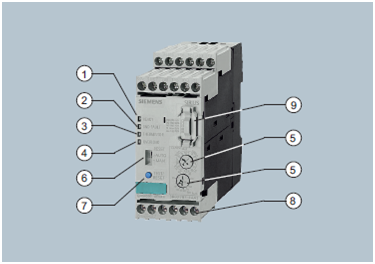 Setting the device to the motor current and to the required trip class dependent on the start-up conditions is easy with the two rotary switches. With this switch you can choose between manual and automatic RESET. Enables testing of all important device components and functions, plus resetting of the device after a trip when manual RESET is selected. The generously sized terminals permit connection of two conductors with different cross-sections for the auxiliary, control and sensor circuits. Connection is possible with screw connection and alternatively with spring-type connection. Enables more functions to be added, e. g. internal ground-fault detection and/or an analog output with corresponding signals.